Bomberos are local firefighters and they are definitely worth of mentioning because the story behind them is amusing. 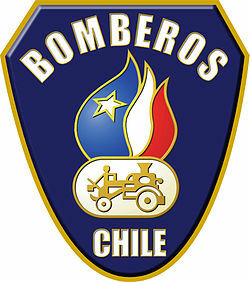 Bomberos were established in 1970 at Santiago, Chile, and they are all volunteers. In one of my classes, we had a presentation about Bomberos and the life style is very similar to fraternity house in colleges and universities in the United States, which is funny. Bomberos are only men. There are few women, but vast majority (99%) are men. They do not recruit people. All their hires are men who came and said: “I want to be a bombero”. Usually those men are younger ranging from 20-35 years old. Their usual day is filled with hanging out and playing video games. They actually have a special room for that. They barbeque and sometimes they do special events for their families. I think that you can all see the funny connection to fraternity house. Obviously, if there is a fire, than they have a work to do, but most of the fires in Chile are wild fires, so Bomeberos in Santiago have less job than the once in Valparaiso. Which means more time with other bomberos and more video games. They do have some kind of training in the begging, but it is incomparable to the Fire fighter training in Europe or United States. Lastly, most man who join are guys who have really nothing to do after college, men who did not go to college or drop out. It is common that they are working as bomber for few years and then they move to more serious job.